You’ve likely seen his work—little red characters crawling around bullet holes in decrepit Beirut buildings, or the whole blue wall of his distinct doodles on Hamra Street—but Jad El Khoury’s most recent creation is tinting the urban skyline. 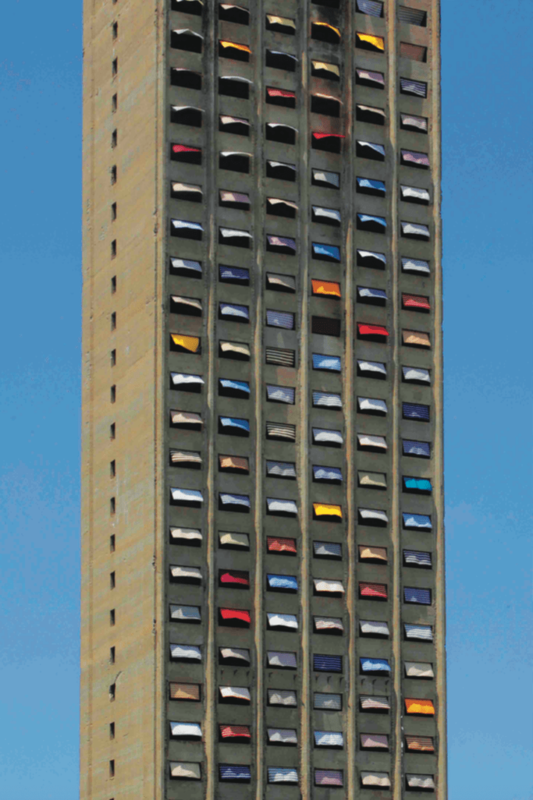 “Burj el Hawa,” or the Tower of Wind, is an instillation of colorful curtains in the windows of one of Beirut’s most iconic and tragic towers, Burj El Murr. Standing at 40-stories, it is an unfinished concrete carcass in the center of Beirut, and, to many, is a memorial of the Lebanese Civil War. Construction halted during the conflict, after which it was used by militias, and became a sniper’s nest, as well as the sight of other atrocities. To this day it bares the family name of its owners, El Murr, but the meaning of the name, “bitter,” is fitting. Authorities have long struggled with the eyesore, but demolishing it has so far been impossible for safety reasons—it is too big and too close to other structures. The artist says he had always feared the skyscraper, which to him looks like a monster looming over Beirut. Upon seeing acclaimed Lebanese artist Marwan Rechmaoui’s “Monument for the Living,” where a replica of the tower reduces it to just two meters, Khoury for the first time felt stronger than the Burj. Khoury and a team of five fitted 400 vacant windows in Burj El Murr with the mismatched balcony blinds typically found in middle to lower-class neighborhoods in the city. Getting Lebanese army approval, the sponsorship of Leticia Gallery and support of friends and family, he made sure to adorn both sides, saying he couldn’t just do the east or west side alone, alluding to Beirut’s historical divide that many still perceive. The artist describes the building as currently “dancing” in the wind with its new colors. Khoury wanted to use the vibrant fabrics to breathe life into the empty structure, which stands in what many, including him, consider a lifeless part of town. “I wanted to give soul to a place that didn’t have one. Downtown is beautiful, but there is no soul, no life. The balcony shades are elements from working-class neighborhoods—that’s where there’s life,” says the artist. The Burj el Hawa instillation is being unexpectedly taken down before its scheduled end date, ostensibly due to safety issues. According to Khoury, Solidere is alleging that rocks are falling from the site. But his journey inside the premises that most have only seen from the outside has yielded a complementary project, an exhibition of the tower’s insides. While photographing the interior of Burj El Murr, especially the graffiti of multiple factions that left their marks on the walls, Khoury says, “it felt like I went back to a very ugly, depressing time.” Scheduled to open on June 28 at Platform 39 art gallery in Ashrafieh, the exhibition will include photos, one of the curtains from the building, other artworks, as well as performances.